Did you survive the Black Friday sales? I don’t know about you – but I ignored my cell phone and tablet for much of the Thanksgiving weekend to spend time with friends and loved ones over the holiday and to focus on what is important. So, this morning I opened my email in-box to find over 80 plus sales and marketing emails from the weekend. Ugh! It was a bit excessive to say the least and annoying! Delete, delete, delete! I really wish retailers would recognize the difference between successful email marketing and spam, because, even if you do opt in for a retailer’s marketing emails. . . too much – IS SPAM! Seriously, some of these online retail websites emailed me 6 times in one day- and on Thanksgiving?? All in an effort to promote the Black Friday sales. I have unsubscribed to several email lists, as of this morning. I promise to offer some holiday inspiration over the next few weeks, instead of a “buy this, sale, shop now, hurry before the sale ends!”, type blog posts. I know how stressful the holidays can be as it is- so I want to inspire you this Christmas, offer some quick diy projects, decorating tips, and holiday recipes here at the Party Fetti blog to make it more enjoyable and not use my blog solely as a marketing platform. Although I do email my subscribers with a sale promo about once every two to three months, in addition to my regular blog posts here – generally with links to my Etsy shops at the end of many of my posts , such as today’s post- still, my priority is to help you to throw the best celebration! 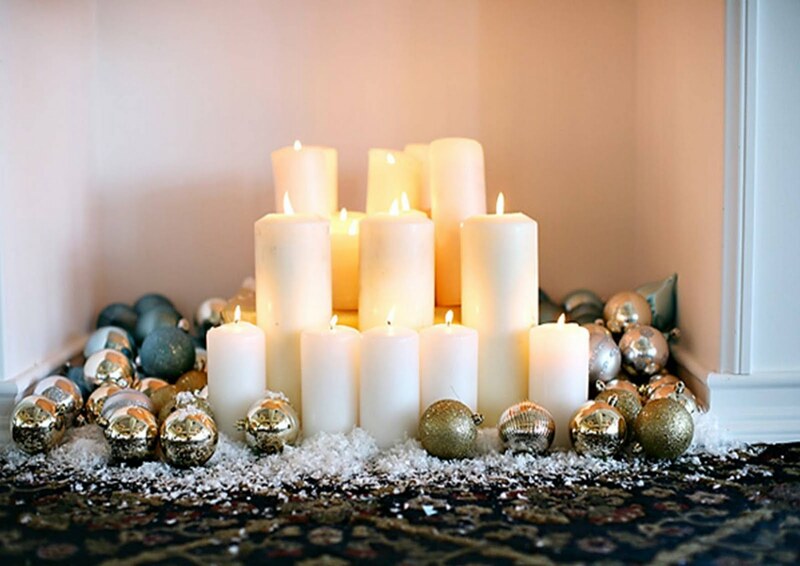 I started this blog to inspire my followers to offer tips for party and holiday decorating and I will continue to offer plenty of holiday ideas over the next few weeks. So, let’s get to it! 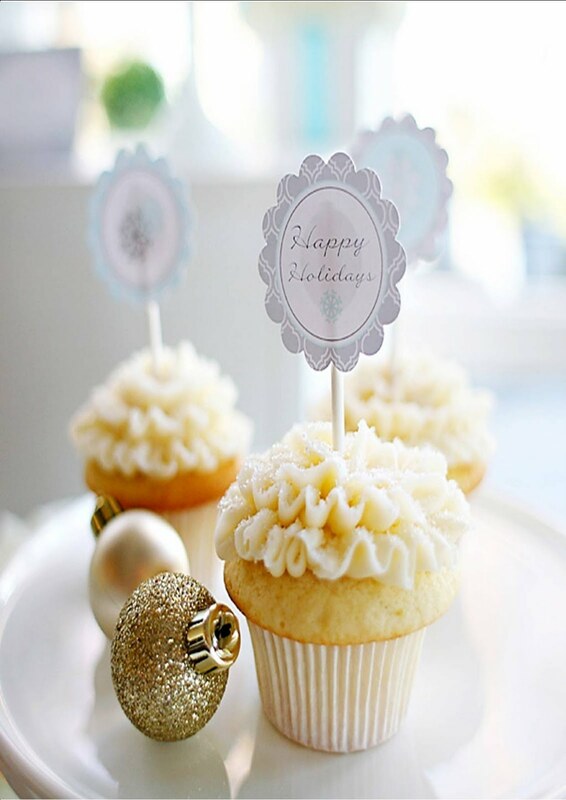 Below I am sharing a quick recipe for Snowball Mini Cupcakes – scroll down for the recipe. Use what you have! 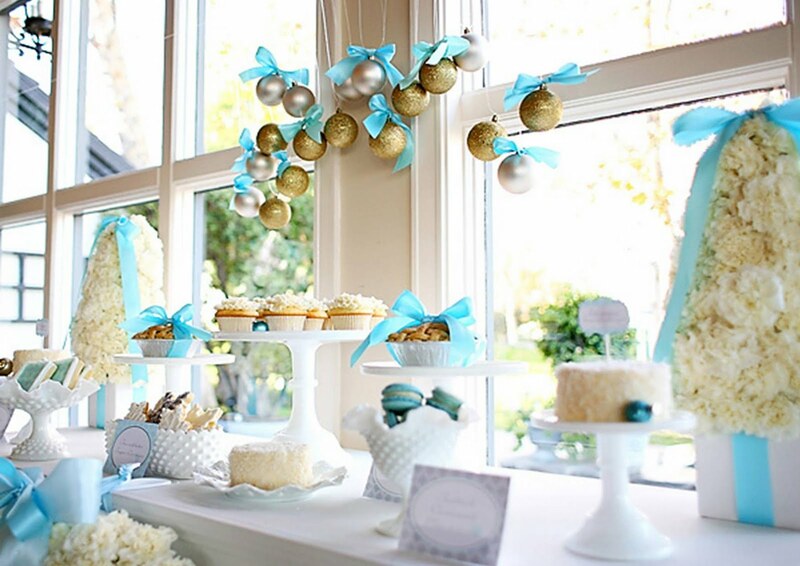 Pull items from your Christmas decorations, such as feather trees, snowflake ornaments, large glass containers, and a simple cupcake stand, like this set up shown above, for a 1st birthday as a Winter Onederland party. Love the pink for the little girl too! Set up a wintry scene with fake snow, white trees, pine cones, and snowmen. 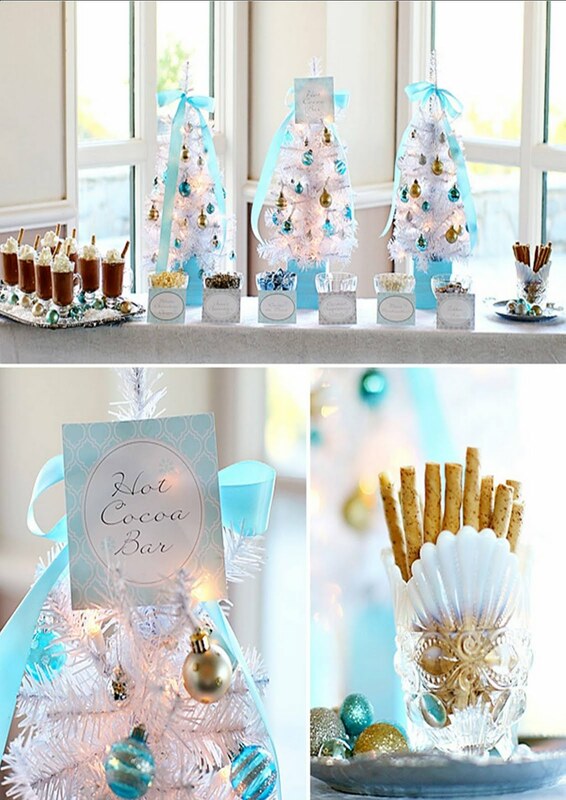 This works for an adult holiday party or for a children’s birthday party. A color palette of white, grey, silver, and blue ties it all together – but don’t be afraid to go with pinks and neon colors for a more contemporary winter color scheme! Cover all your candy and wine bottles (or soda bottles for the kids) with coordinating printable labels. You can find many complete printable party kits on Etsy – if you are a diy’er and don’t mind a few hours of cutting with scissors- this is a huge money saver for any party. You just need a good quality home color printer. A straight cutter (a paper cutting tool that many scrapbookers use) will save you time on the cutting too. Preheat oven to 350°. Spray 2 (24-cup) mini muffin pans with baking spray with flour. In a large bowl, beat cake mix, milk, oil, and eggs with a mixer at medium speed until moistened, about 2 minutes. Divide batter among prepared muffin cups. Bake until a wooden pick inserted in center comes out clean, about 12 minutes. Let cool in pans for 5 minutes. Remove from pans, and let cool completely on a wire rack. In the bowl of a stand mixer fitted with the whisk attachment, beat cream and pudding mix at high speed until fluffy. Spoon mixture into a piping bag fitted with a small round tip. Make a small incision in the bottom of cupcakes, and pipe 1⁄4 teaspoon vanilla mixture into centers. Pipe vanilla mixture over tops of cupcakes; sprinkle with coconut. Serve immediately. Come back to the blog all this month for more holiday inspiration! Happy Monday! Today I am sharing a quick and super easy DIY for creating some beautiful decorations for a Disney Frozen themed party or any winter themed event! 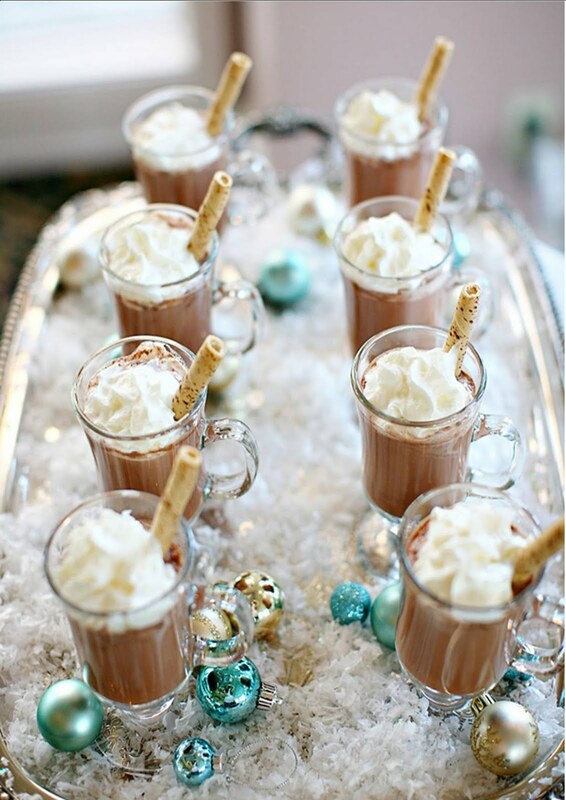 Perfect for a Winter Wonderland party too! It’s so easy, just follow the visual How To tutorial below. 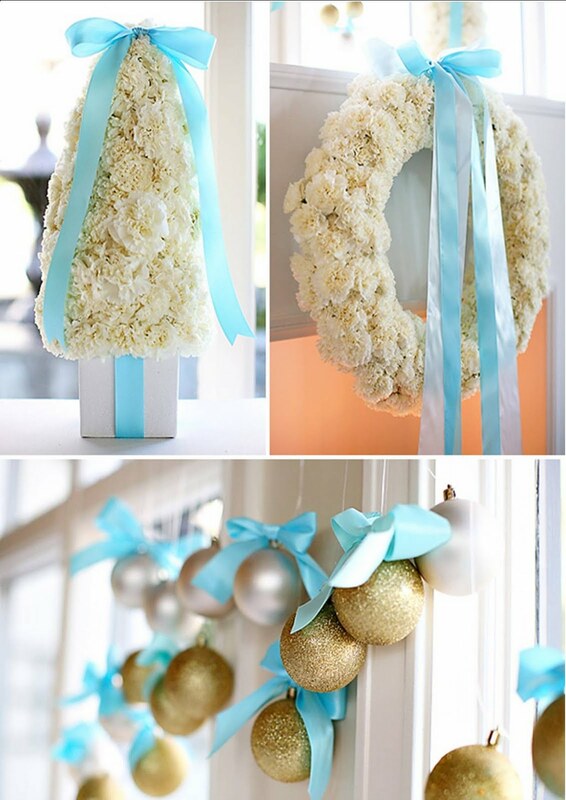 For larger hanging table backdrop snowflakes, just increase the size by double or triple for each of the cut pieces. You can cut your rolled cones larger for the snowflakes by turning your letterhead page to profile, instead of landscape, and cut each one larger, one to a page. Or simply use 12″ x 12″ cardstock in solid colors of shades of blue or scrapbooking pattern paper. MAY YOUR YEAR BE FILLED WITH HEALTH & HAPPINESS! Thank you for following the Party Fetti blog through 2015 and we hope you will subscribe and stay with me throughout 2016! I am thrilled to say, that I’ve been designing and make party decor and sharing my designs here on the blog for over 5 years! I’ll be sharing my annual wedding trends for this coming year soon and so many stunning party ideas to help you get ready for your next party, celebration and event this coming year. 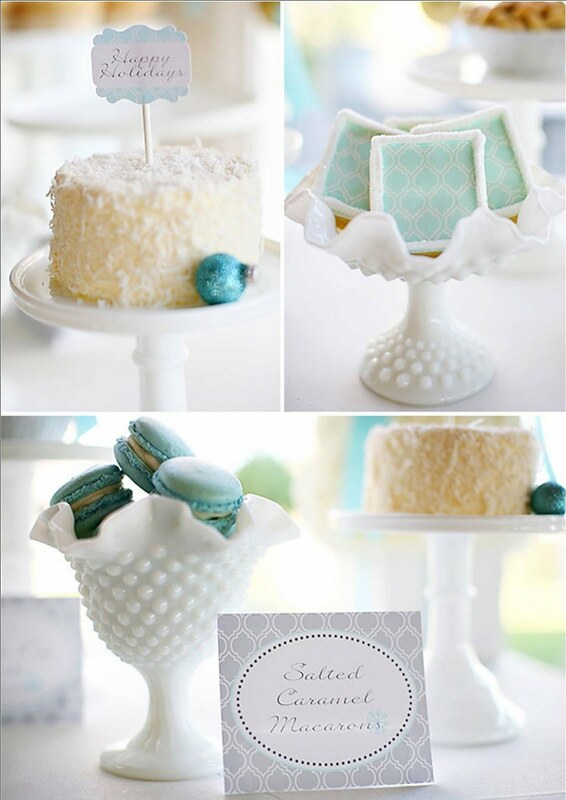 Everything from cake recipes, easy DIY party decorations, designer party tablescapes to inspire you and popular themed parties for 2016. Stay tuned with me and definitely subscribe to our weekly emailed blog posts. Feel free to post comments or questions, if you are unsure about one of the steps above. Happy to help. Be sure to stop by any of our shops too for some VALENTINE’S DAY decorations for your upcoming celebration of LOVE! Gold is still trending this year for the holidays so I could not resist sharing this gorgeous set up for a Christmas dessert table for a holiday soiree! 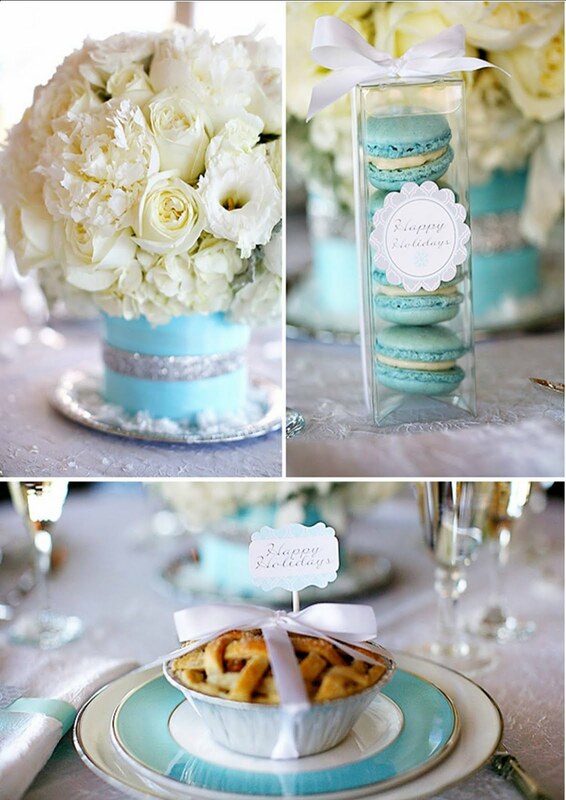 This stunning wintery color palette is perfect for a glitzy holiday party, a winter baby shower or even a December birthday celebration! There are so many lovely details from the beautiful wintery white florals to the creative hot chocolate bar to the amazing desserts! We’re still shipping from our Etsy shops for the holidays, so it’s not too late to add a little holiday bling to your home. Visit any of our shops for some gold decor of your own! And don’t forget to grab our FREE Christmas Printable! Just click on the link below to download it without the copyright overlay! Thanks again for stopping by Party Fetti! Since the Disney movie Frozen came out, I continually get asked by my regular event planners and Etsy customers to make these giant snowflakes. While making them is not an issue- I have yet to figure out how to ship these so they would arrive in one piece. I do make and ship many favors and decorations that require some ingenious creativity just to get them across the country safely – these are just one of those few delicate items that I have racked my brain over the shipping mystery and finally just came to the conclusion that I can not get them on someone’s doorstep without them ending up bent and crumpled by the USPS. So today I thought I would share a tutorial and some easy DIY tips found on other wonderful blogs and websites on how to make these stunning giant snowflakes. They really are very simple and don’t require much time or a lot of special tools. You can visit Handimania for some great step by step instructions and photos. And Karin has made it so simple with a wonderful video too. Just click on the photo below to be taken directly to the craft video tutorial.